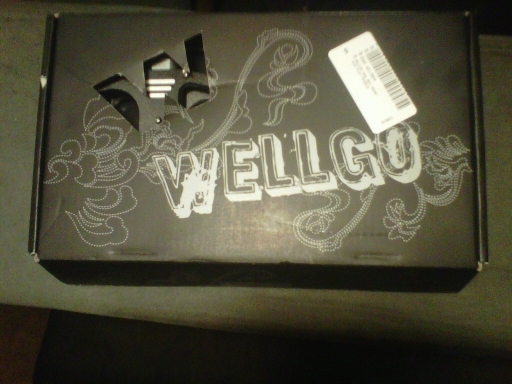 Loyal reader, Cat McKinnon submitted a product review of a set of Wellgo pedals. Scroll down to read a great review. I’ve been needing a new set of pedals for a while now, so I fired up my web browser, checked out a couple online dealers’ websites and looked at dozens of platform-style pedals (I mainly ride XC/Trail stuff, and no, I don’t like clipless pedals). I needed something grippy and durable, yet affordable. Although I looked at a lot of different pedals, I kept going back to Wellgo’s. Many of their models bore more than a passing resemblance to a lot of the “brand name” pedals, but were far less expensive. Being the smart consumer (ie, I hate wasting money), I checked out every user-review of Wellgo’s that I could possibly find online…What I discovered is that Wellgo is actually an OEM (Original Equipment Manufacturer) for a lot of well-known pedal manufacturers. So I decided to give it a shot and ordered a set of Wellgo B67’s from PricePoint, because they fit my criteria: sealed bearings, CNC-machined (not cast) aluminum platform, CNC’d CroMo spindle, and set-screw type pins. And at $39.98 for the pair, the price was definitely right! 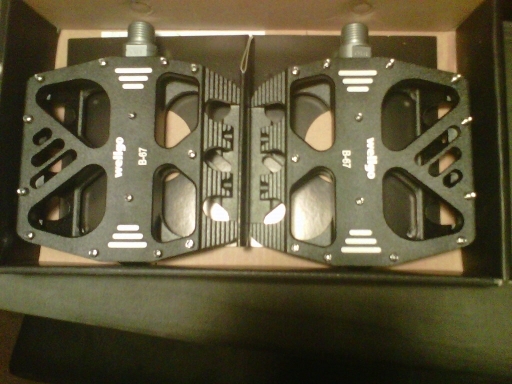 Four days after ordering, I received my pedals, along with a Sette pedal wrench* that I ordered at the same time. 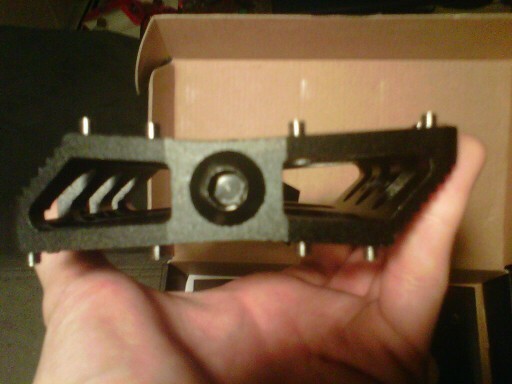 The pedals came in a nice black box, with their specs clearly marked on the back edge of the package. 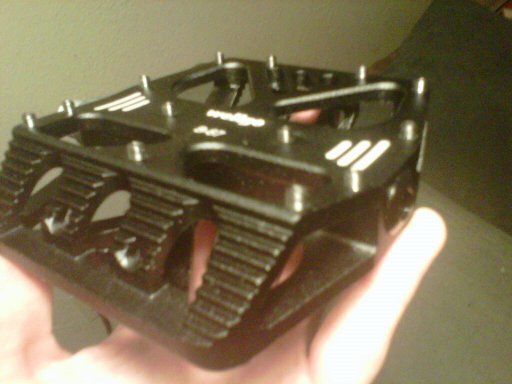 The first thing I noticed when I removed the pedals from the box was how nice the machining and powder-coating was. The axles spun super-smooth, but not too freely, and there was no side-to-side play that would indicate a loose axle (or craptastic manufacturing). The pins were all installed snugly (and had thread locking adhesive applied, as I discovered after unscrewing a couple of them to check). Honestly, I couldn’t find anything wrong with the pedals and they just screamed “quality”. While they seem big in the photos, they’re actually a pretty “normal” size, a least for a pedal like this. Comparing them to a set of ultra-cheap nylon pedals that I keep around for emergency or loaner purposes, they’re not a whole lot bigger and actually seem to weigh a hair less than the plastic cheapies! I measured them at 20mm thick along the axle (and 88mm front-to-back, and 100mm wide, for those that want the size specs). Total listed weight for the pair (according to Wellgo’s website) is 540g, which about 1.2 pounds for the pair…not super-light, but certainly not bricks either. I don’t have a scale to weigh them, but the weight feels about right. After scrutinizing the B67’s for a few minutes (for flaws I never found), I installed them on my bike using the Sette pedal wrench. The Wellgo’s have standard 15mm wrench flats, but they also accommodate an 8mm hex wrench on the crank-end of the axle as well, which is often only found in more expensive pedals. It definitely makes installing them much easier! Once I took the pedals out on a local trail (mostly non-technical singletrack, with the occasional obstacle), I really got a good impression of how they worked and felt. With a pair of DC shoes, as well as more traditional “lugged” mountain bike shoes, they gripped like super glue…in fact, they were so grippy that it took me a little while getting used to the fact that I had to almost lift my foot off the pedal to shift it around. You definitely can’t slide your foot around on these like you can on the smooth chrome type pins. I liked the feeling of control and connection I got with the pedals, without that nervousness I get when clipped in. The pins are spaced just right, providing grip everywhere without causing any weird pressure points on the bottom of my feet, and the platform is slightly concaved for a more comfortable foot position. While I didn’t have any major crashes, I did lay down my bike once or twice…the pedals held up fine, with no scratching and no bent or lost pins. I know some people don’t like the set-screw type pins, but I prefer them because I can get replacements at the local home improvement store for just a couple dollars. After riding them on several trail rides (in some unusually dry and dusty conditions, I might add), they still feel brand new even after being beat up a little bit. Granted, I didn’t have any big crashes, but they have hit the ground a few times, as well as scraped on rocks and logs, and don’t look any worse for wear. The bearings are smooth and noise-free, the aluminum platform and black powder-coating should hold up for a long time, and there are plenty of pins to provide more traction than you’ll probably ever need. I can’t imagine these needing service very often, and I think they’d be just about ideal for downhill or freeriders. And let’s face it, it’s hard to find any other pedal with this level of quality for under $40! So what’s not to like? Well, not a whole lot. If you are concerned about size and weight, there are certainly thinner and lighter options, but they’re probably going to cost a lot more. The B67’s really aren’t aimed at riders that need the “raciest” pedals out there, but they have all of the quality that pedals two or three times more expensive have. They also have a type of pin that some people don’t like, although Wellgo does make other pedals with different pin types, so that’s something else to think about. 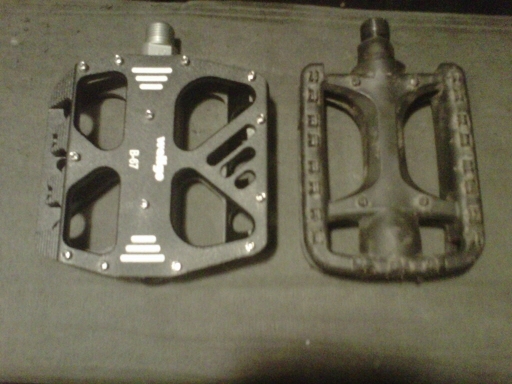 But overall, I have a feeling these pedals will outlast the bike I have them on now, and while they don’t have a big name-brand stamped on them, it’s easy to forget about that when you realize they only cost $40! 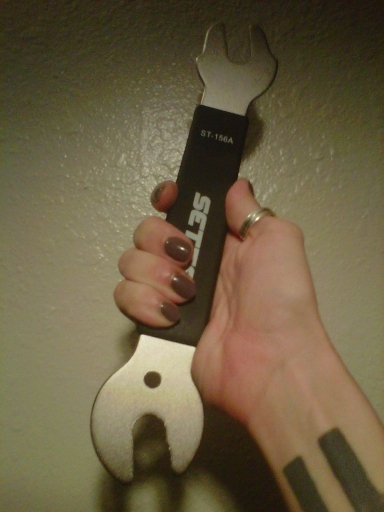 *Sette Torx pedal wrench quick review: When I ordered my Wellgo B67 pedals, I also took a chance and ordered the Sette Torx Pedal Wrench. It’s a double-ended wrench that can handle the standard 15mm pedal wrench flats, as well as older 16mm and 17mm pedals. For about $8, I was highly impressed. The wrench is hefty chrome-vanadium hardened steel, with an 11” padded handle area. At about half the price of the cheapest Park Tool pedal wrench, it’s a GREAT investment and should serve almost everyone. The only downside is that, since it’s double-ended, you can’t use a cheater bar for those insanely old, rusted-on pedals. But for the vast majority of riders, it should serve very well for years. Great review — I wonder if there is any difference at all between the pedals Wellgo sells under its own name and the ones it makes for other companies to sell under other brands. As for tools, I have not tried Sette but I bought a set of bike tools from Nashbar and they have been really good — not shop quality, but more than adequate for a home bike mechanic, and very inexpensive. I have replaced a couple of the ones I use a lot that have worn out with higher quality tools, but the pedal wrench has been fine. I see no reason to blow a lot of money on things like crank pullers that you will use maybe once or twice a year. I love Wellgo pedals…I have them on all three road bikes and two of my other bikes. They are good stuff and especially nice for the frugal among us. P.s. Cat, LOVE the nailpolish color!!! @Ghost Rider: Wellgo certainly makes some cheap pedals that are lower quality (and so do Shimano, for that matter), but i think once you start getting into their CNC-machined range of pedals with sealed bearings and stuff like that, that’s where the really great bargains are! and thanks for the compliment on my nail polish;), it’s one of my current favorite colors. it’s Sally Hansen Insta-Dri in ‘Slick Slate’. it was only about $3.50 at my local grocery store. For those who like to use clipless pedals… the Wellgo W-01 are hidden gems! Virtually the same mechanism as Shimano spds, use the same cleats, and 20g lighter than XTR M980! While I depend on a set of Shimano XT trail pedals for my trail bike, I do use the wellgos on my commuter and single speed bikes. Previous PostPrevious 1st batch of Pink Tuxedos are in.